NEW: Wegenpicks can offer you the service of making any tip on any Wegenpick at the thickness you desire. Now have the best grip and the best tip combined for your style in just one pick! NEW: Online payment through PayPal . 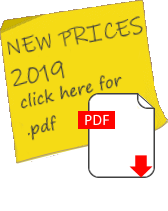 Click Buy picks for further details. One of these solutions was making picks for gypsy jazz style. And the picks are among the best available for this style worldwide. And what wonderful reviews I received on the Standard model, now called the Gypsyjazzpick. Please click on the comments link at the bottom of the page. Price: USD / EUR 16,50 a piece. These come in yellow packages, and you can buy these picks also from people who have some stock. See below for addresses. it's very loud. This pick makes you fall in love again with your acoustic guitar. You'll get a sound out of your guitar, so loud and sparkling, you never could have imagined is was in there all the time. This pick brings it all out. It's 5 mm thick,( Just look at the picture with the CD jewel case) but this Wegen-design makes it very easy to control. In the picture you can see the grip I make on the Fatone. It's very much like the grip I make on the Gypsyjazzpick. Get your volume and tones to a higher level. The Fatone makes a difference, you can feel it, and hear it even more! ( I hope you have a proper build guitar using this pick, it might fall off your lap in pieces.........) USD / EUR 17,50 a piece. These come in green packages For the time being, only available from me. Use the Order Form to order them today! These picks are offered in a 4 picks package. USD / EUR 16,50 for a package. These come in blue packages. In cooperation with Bigcitystrings.com we have developed this little jazz pick: the Bigcity Pick It's especially designed for acoustic jazz and blues guitar. (But it will also do fine on electric guitar) It's 29 mm long and 1.8mm thick. These picks come in a 4 picks package. USD / EUR 22,- for a package. Go to the Order Form to order them immediately! Research and development is what we like to do, and our new self-designed and self-made tools are helping us setting new standards in pick-land! Hit the <Order Form and order them today! The triangular cousin of the GP 250. Great feel, grip, sound and wear . More suitable for playing solo, but feel free to make this one go rythm playing! The triangular cousin of the most popular Wegenpicks model, the Gypsyjazzpick! Great feel, deep grip, close to tortoise sound, and perfect wear. Did I mention the triangular Wegenpicks have great balance? This pick will take you far in both solo or rythm playing. The triangular cousin of the Fatone. It is fat. It is big. Is it a monster? (To create one, it is) No, this pick really shows what Wegenpicks is all about. Great design, heavy grip, and the best material we can lay our hands on. We make the tools for the job. This is the new beast for playing rythm for a long time to last. Show us your worn out Trimus 500 pick, purchased in 2003, in 2013, and we will replace it for free! The triangular pick in the most popular shape and size for thinner triangular picks. All the TF Wegenpicks have the "fingerprint" surface, beveled tips for fast playing and seven holes for grip. No holes for grip is optional. The number indicates the thickness in mm. TF 100 is 1.0 mm, TF 120 is 1.2 mm and so on. USD / EUR 16,50 for a two-pack. The following models have added to the Wegenpicks product range recently. Full information is not yet available for publication at the website: please contact your dealer or Michel Wegen for further information. Each pick is made by hand, so if you would like to have a custom made pick, please let me know what you would like. I can offer picks in any shape, and in almost dimension. So, ask me if you have any special wishes, you won't be the first ( and probably not the last) who will find out that special picks aren't hard to get, after all. Wegenpicks is always working on customer satisfaction: We now can offer all the Wegenpicks also in black. It's the same material, with all the same features. Please specify black or white on the orderform. Making custom made picks can be a work of precision. If I you would like a pick to be exact 3.45 mm thick, 34.3 mm long and 27.25 mm wide, I can make it. 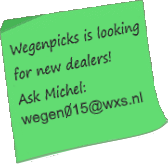 Visit a Wegenpicks dealer (in real or online) to get your picks. Wegenpicks has over 50 dealer locations world wide! Pay and order online with a PayPal-account (quick and free sign up). You can always contact me for all kinds custom-made picks, but when you would like to order a standard gypsy jazz pick for right-handed players, it's easier to contact one of the people on the dealer list. The dealers marked with a have the complete Wegenpicks product range in stock. The easiest way to get in contact with me, is to send an e-mail to the address michelwegen@wxs.nl. For non-virtual correspondence, I use my address below. Many professional and non-professional guitarists all around the world use my picks. Here you'll find a short selection of links to their home pages and some other cool pages. See some other work of mine! Jason P. Riley is another excellent guitar player! He really can use any guitar for any style. He can play Bach to anything what comes next in any style. What a guy! http://www.jasonriley.com Enjoy! Hot Club of Hungary, fine band!